Faisal Hussain, the 29-year-old shooter responsible for the rampage in Toronto's Greektown neighbourhood, was from Pakistan's Jhelum. The suspect, armed with a handgun, opened fire at 10pm on Sunday on a stretch of Danforth Avenue filled with restaurants and family-friendly attractions in an area of east Toronto known as the Greektown neighbourhood, the SIU said. Files, being reviewed by the police, include concerns that Hussain expressed "support" for a website that was seen as "pro-ISIL," says a law enforcement source. Sources say Toronto police and the Canadian Security Intelligence Service (CSIS) officials in Ottawa, as well as the Royal Canadian Mounted Police (RCMP), are looking into his past, which sources say, include his residence in Afghanistan and Pakistan. Hussain apparently had been spoken-to by authorities about his online activities. Sources say Toronto Police, the Ontario Provincial Police (OPP) and the RCMP have all had an interest in the now-deceased alleged shooter. What law enforcement agencies are saying is that the attack was planned, and Hussain was "well known to Toronto Police" for investigations into past crimes "involving weapons and violence." According to sources quoted by the Canadian media house Global News, Hussain's family had been going through major challenges. Hussain lost his sister to a car accident, while his brother was hospitalised following a stroke. He also struggled with mental health issues since 2010, as confirmed by Hussain's parents. It was the second deadly act of mass violence this year in Canada’s most populous city. 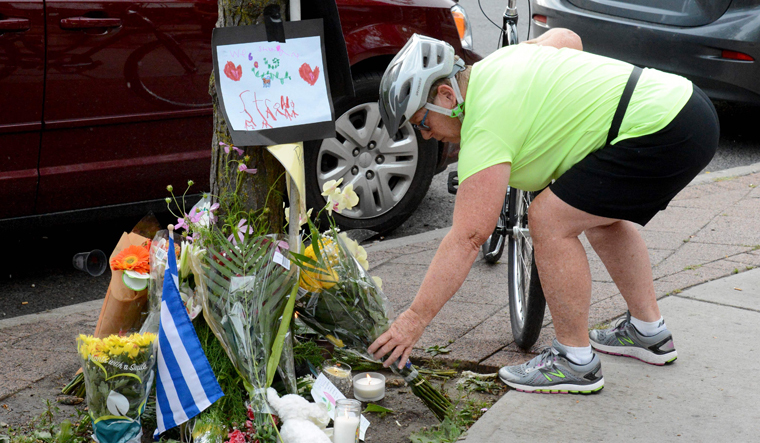 In April, a driver deliberately ploughed his white Ryder rental van into a lunch-hour crowd, killing 10 people and injuring 15 along a roughly mile-long (1.6-km) stretch of sidewalk thronged with pedestrians. Local politician Nathaniel Erskine-Smith confirmed the 18-year-old victim was Reese Fallon, a recent high school graduate who planned to study nursing. Hussain exchanged fire with police, fled and was later found dead, according to the SIU, which investigates deaths and injuries involving police. On Monday evening, Toronto police were executing a search warrant at an apartment in a densely populated neighbourhood in east Toronto, where the suspect lived. “Why does anyone in this city need to have a gun at all?” he asked in an address to city councillors early on Monday. Bill Blair, Canada’s newly appointed minister of border security and organised crime, who has been given the job of tackling gun violence, met with Tory on Monday afternoon. To own a gun in Canada, an individual must apply for a licence, pass a background check and pass a firearm safety test. Guns must be kept locked and unloaded and can only be legally carried outside the home with a special permit. Handguns and other restricted firearms require passing an additional course. Canada’s crime rate rose by 1 per cent in 2017, the third consecutive annual increase, according to Statistics Canada. The murder rate jumped by 7 per cent, due largely to killings in British Columbia and Quebec, while crime involving guns grew by 7 per cent. Toronto, despite a murder rate lower than that of large US cities, is grappling with a sharp rise in gun violence as gun deaths jumped to 26, up 53 per cent so far this year from the same period in 2017. The number of shootings has risen 13 per cent. Toronto has deployed about 200 police officers since July 20 in response to the recent spate in shootings, which city officials have blamed on gang violence.